Per plan, Erika was there to meet us for the drive to Bernau. After our traditional walk at the Chimsee Lake and a day of rest, the three of us were on our way to Vienna. Our first stop in Austria was Spitz, a smal town along the Danube River. 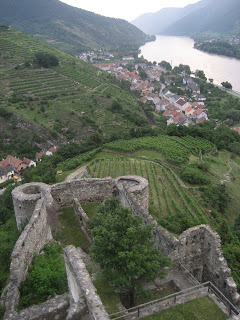 We found a small winery and tasted nice white wines (Gruner Veltliner, Weissen Burgunder and Riesling). We also tasted a light red wine called Zweigeld. We stayed in a small Gast Hause (guest house) near the winery. 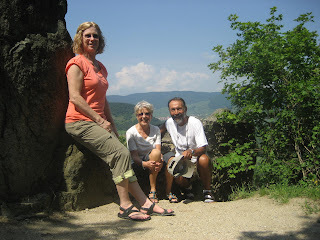 After getting settled, we went for a walk to the ruins of a castle that dates back to the 1200 and overlooks the Danube. Quite spectacular. 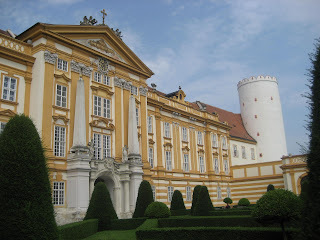 The next day, we back-tracked a few miles to cross the Danube to the Melker Stift. It is a huge monastary built in the 12th century that rooted its teachings St. Benedict and was later turned into a monestary and a school (which is still is today). 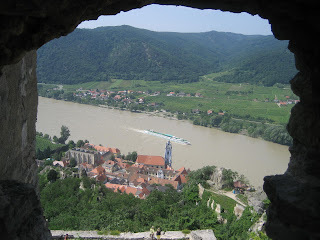 After the visit we continued on the Danube wine trail and spent the night at another guest house in Weissenkirchen in Wachau. Our room had a panoramic view of the area and of the Danube. When you meet an Austrian, he or she will typically greet you with a "Gruss Gott", which means Greet God. I started saying it too but got some interesting looks when a couple of times I mixed up the main vowels and said "Gross Gut". I tried. Diane just said "hello." Vienna is a cosmopolitan city with wide boulevards, beautiful parks and lots of coffee houses. It's the home of Mozart, Strauss, Beethoven, Haydn, Schubert, Wagner, the Waltz and of course Apfel Strudel. The ubiquitous coffee houses are viewed as an extention of the Viennese living room. 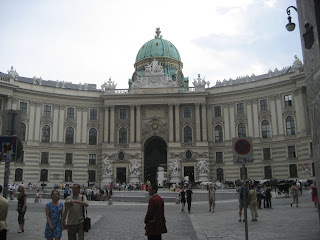 Vienna dates back to the Celtics and the Roman Empire. But most of today's beautiful architecture is due to the the Hapsburgs and others who ruled the area for latter centuries. Some interesting facts we learned: Beethoven lived at eighty different addresses, mostly because he liked to play piano until late at night and he often didn't pay his rent. Napoleon occupied Vienna twice before being exiled to Elba. He married the daughter of the Austrian emperor and she bore him a son who the Viennese were very proud of. Unfortunately he died from a lung disease at twenty-one. The Danube is very important in this region because it was strategic in trade and transportation between the West and the East. It also marked the bounderies between countries. 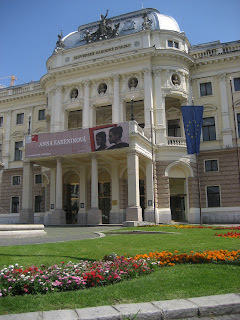 Vienna is the home of Freud and psycho-analysis. Freud's couch, however, now resides in London. Vienna is the only European capital that grows grapes and makes red and white wine. The Third Man, with Orson Wells was filmed here, part of the scenes being filmed at the ferris wheel. 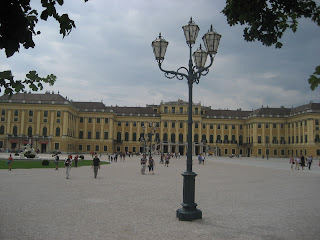 One of the more impressive palaces we saw was the Schonbrunn Palace, the home of Emperor Franz Joseph and his wife Maria Theresa. Both were interesting people in that he considered himself to be the people's public servant and worked tirelessly towards that goal. She in her independent approach to her position as a dutches. Together they had 16 children, in which the daughters were always married off to build strategic relationships between countries. 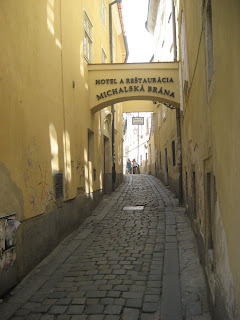 After Vienna, we went to Bratislava (Slovakia) for the day. Also on the Danube, Bratislavia is the capital. We only went to the old city - nice, compact with a lot of charm, but nothing out of the ordinary. After seeing so many charming towns, one can get dispassionate to the sight of yet another cute town square, a majectic castle, a beautiful cathedral or yet another ornate "rathause" (city hall). Tomorrow we are taking the train to see some of the countryside of Slovania, ending up in its capital of Ljubljana.